"What a weird ball of junk..."
Sidella Solston has decided to skip work for a couple of eons. In fact, while she's at it she might as well just hop out of the universe. She's tired of her job, tired of people, but mostly just tired. Relationships haven't panned out, she isn't really 'feeling' her job, and overall the whole planet seems unsatisfying. Frustratingly enough, only astronauts and billionaires normally get to leave the world behind. However, a hundred crack-pot ideas and some experimenting with gadgetry lets her find another way off the big green rock. Della hijacks a room in her university's museum to build a mad-science project that sends her somewhere else entirely. Unfortunately, that somewhere else entirely proves to be inhabited by a rather interesting crowd. Their leader, DirNaut, finds it rather odd to see Della, a strange new addition to the SyncPoint. That's because, usually, no one means to arrive on that weird little ball of junk. 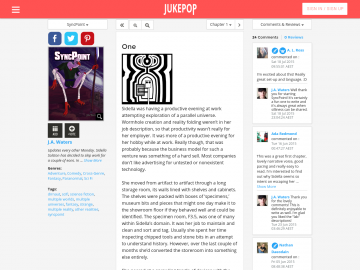 SyncPoint updates first and third Mondays on JukePop. SyncPoint has not been reviewed yet. SyncPoint has not been recommended yet.